Serving excellent Japanese cuisine on the Mainline since 2005. We are dedicated to great customer service and developing unique cullinary creations to be enjoyed by everyone. Our menu features variety of raw and cooked seafood delicacies. Come visit us today and you will enjoy the casual yet delightful dining atmosphere. 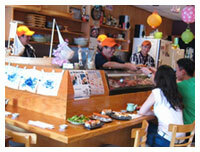 www.SushiLand.us since 2005. All rights reserved. Created by QnB Web.